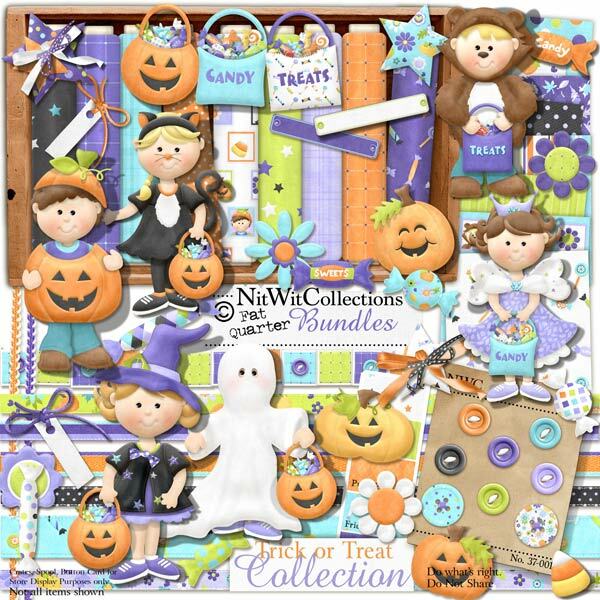 "Trick or Treat" Collection has an obvious Halloween theme to it, but also contains several elements and papers that can be used for many other genres. The cute costumed kids are the stars of this kit, and hopefully take you back to your years or your children's years of the frantic race to see how much candy you could collect before the deadline time of people turning out their lights!! Don't overlook the great colours and patterns in these papers which may work for other creations that you are looking to make. 4 Bows - almost bow-tie like?? 8 Buttons - cause we know you'll need lots to create that costume that your kids just must have! 7 Candies - being that they're digital, you'll never run out!! 1 Pirate costumed boy - see his treat bag, he's been "pirating" already!! 4 Stars - "My Heavens, My Stars"! 2 Ties - rope like to hold their costumes together as it only has to last for a few hours!